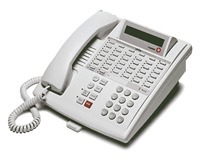 The Partner 34D Euro Telephone Set has 32 programmable buttons with dual LEDs for line or feature appearances. 2 line x 24 character backlit tilt display. Built-in conference, transfer, hold, and speaker buttons. Full duplex speakerphone for hands free operation. Built-in port allows for connection of standard devices, such as modems or fax machines Compatible with Partner ACS, Partner Plus and Partner II systems Release 3.0 and higher. Expand the capacity of your PARTNER 34D phone with the Call Assistant, which adds another 48 button capacity.